It’s hard to avoid talk about how the world is doomed due to global warming these days; feels like every other day some news network is talking about it. Rising water levels, increasing temperatures – signs that science says point to some potentially dangerous outcomes. Some people dismiss it as hogwash, but it’s hard not to look at the circumstances and wonder could happen if we don’t do something. The Aquatic Adventure of the Last Human is set in a world where we failed to address those concerns. It begins upon your return to Earth a thousand years after your departure. You are one of many people sent out into space to look for a new viable planet to move to in the wake of Earth’s dwindling resources. The game opens with your ship entering a wormhole in the hopes of traveling deep into outer space, only to find that instead it sent you far into the future. You return to Earth to find it is now encased in ice. The ocean has overtaken the planet entirely. Civilization adapted for a time, remnants of underwater cities a common sight, but they still perished in the end. The Aquatic Adventure of the Last Human is light on story, though holotapes grant some insight into life before extinction. Allusions to political strife between districts, terrorist groups causing trouble, and the general struggles of day-to-day life underwater depict humanity trying, and failing, to maintain a sense of normalcy. The holotapes never explore what, precisely, led to the our extinction to keep the mystery alive. The game does show its hand eventually, and its parting message is… not hopeful. The Aquatic Adventure is a Metroid-styled game – which is to say, it gives you a large, interconnected world to explore – but it’s different from its contemporaries in that it is very light on combat. The majority of your time is spent exploring the pastel-colored seascape. The game is at its most relaxing in these moments. Drifting along, watching the inordinately large fish swim by, left me in awe of the beauty of this world. It also demonstrated just how small and insignificant you, a lone submarine surrounded by massive aquatic life, are in this situation. The often serene music that underscores these moments suits the thoughts of reflection that are born from the environment. You’re generally safe as you explore, though a few hazards like mines, clams, and pipes leaking acid prove troublesome. But they’re easy to bypass, serving only to add an ever so slight touch of danger. 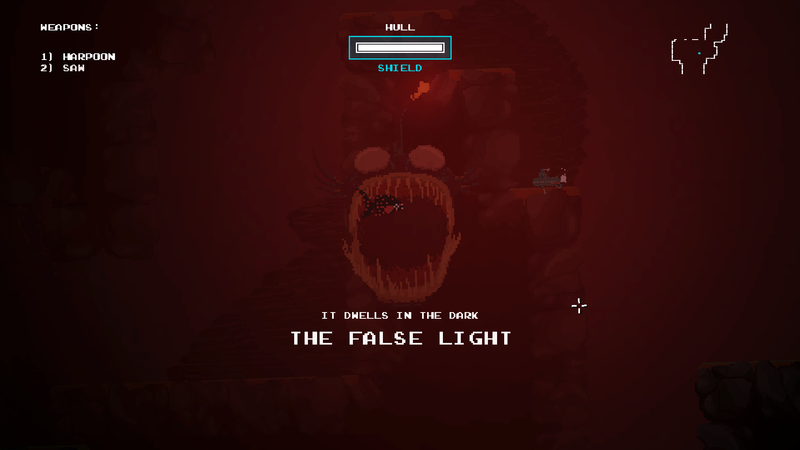 Occasionally you come across lager boss creatures, however, which is where combat comes in. The Aquatic Adventure of the Last Human feels like Shadow of the Colossus in how it handles boss encounters. Each boss fight is long and difficult, the majority of your time spent working out how to survive. Attacking them isn’t an issue – they seldom have weak points you have to hit – so much as avoiding their own attacks. Your sub doesn’t move especially fast and you don’t have access to any good evasive maneuvers early on. This is compounded by the fact you can only fire at enemies when they’re below you as well, for the only weapon you have for a while is a harpoon attached to the bottom of your craft. That said, the fights remain fair even with the odds stacked against you. It’s a simple matter of knowing when to attack and when to retreat. Figuring that out is easier said than done, of course, especially given each boss’ tendency to fire all manner of projectiles onto the field or call for backup. Thankfully the game doesn’t rely on those tactics until you’ve gotten the proper tools to avoid them. With each boss you slay, you’re granted a new piece of equipment. Usually it’s an auxiliary tool that allows further exploration, like a saw that cuts through vines or a light to help you move about in the darkest reaches of the ocean caverns. It’s tough to tell which boss you should take on since you usually have access to at least two at any given time, especially since some of the tools you earn can make other bosses easier. By earning the saw, for instance, I was able to destroy another boss’ healing source. Not having to worry about dealing damage quickly to prevent it from recovering made it far more manageable, though still plenty difficult. There were a couple of bosses that felt like they leaned too hard on the artificially difficult side, though. The Chain Gang, for instance, a massive shark pulling a couple of mines accompanied by a horde of normal-sized sharks that you have to fight off in an area with low lighting. You often can’t see the smaller sharks coming before they ram into you en mass, resulting in many deaths that I couldn’t do nothing to avoid. Fighting off either of those solo would be difficult enough, but throwing them both at you together is overkill. Worse, you’re locked into the fight thanks to an autosave occurring just as the fight begins. Once you start it, you can’t go back and search for more upgrades to better prepare yourself. You’re stuck there until you manage to win. That doesn’t happen anywhere else, thankfully, but that it happens at all is frustrating. All in all, its battles are mixed. The majority pose an enjoyable challenge, though some of the later boss’ reliance on completely overwhelming you detract from the fun to be had there. The Aquatic Adventure of the Last Human is at its best during exploration, seeing what the world has become and piecing together what led to our demise. It’s not an especially long journey, but it’s a fascinating one while it lasts.